Before purchasing a flat or apartment some basic things must be considered to make things going right. Vastu recommend some essential tips regarding construction and direction of flat or apartment while if you are interested in existing flat then Vastu offers rules regarding existing flat as well. Construct or choose a flat/apartment having entrance in North, East or North-west. Avoid main door in South, South-west or South-east. Avoid purchasing flats with cuts in North-east or South-east direction. Drainage pipes should have their way in West, North or North-west. Slope of balcony should be towards the East or North. 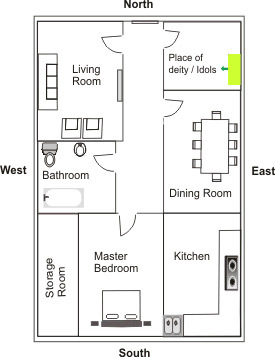 Check out the North-east corner of flat as this portion must be converted into worship room or left open. Kitchen should be in the South-east direction. Check or construct over-head tank in South-west and underwater tank in North-east. No flat or apartment can be completely Vastu compliant as there are many faults and defects in every plot. However these faults whether in a newly buy plot or existing flat can be corrected with measures and remedies.